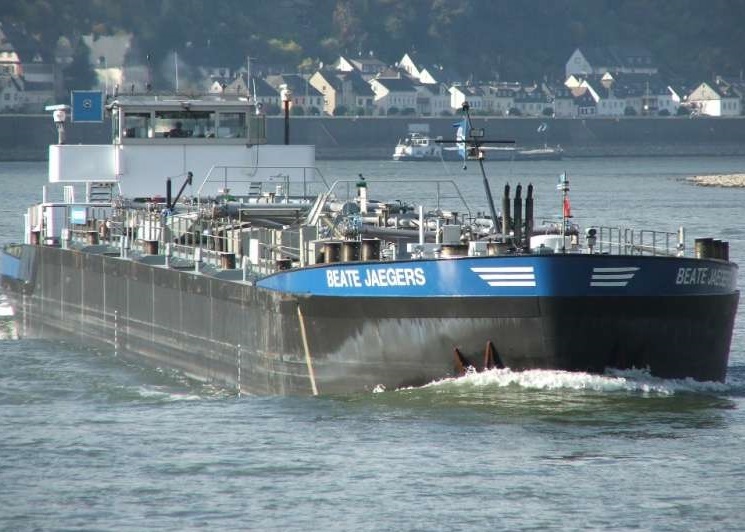 The tanker Beate Jaegers suffered bow breaches after collision with another loaded tank barge in Volkerak lake. The vessel was en route from Duisburg, when the tank barge lost propulsion power and headed against her. The tanker Beate Jaegers maneuvered in last minute, but was not able to avoid collision. The both ships collided by portside fore, which caused breaching of the tanker Beate Jaegers. The both vessel remained afloat, but were detained by the local authorities for safety inspection and repairs. The tanker Beate Jaegers suffered large hole in the bow section above the water line, but without water ingress and immediate danger for the seaworthiness. The vessel was docked at Weurt West Canal in Nijmegen for repairs and inspection. Fortunately during the accident there were no injured people and no oil leaks. There was no reported water pollution and no damages of the cargo and fuel tanks. The investigation for the circumstances and root cause of the accident is under way. The tanker Beate Jaegers has overall length of 110.00 m, moulded beam of 10.50 m and maximum draft of 3.10 m. The gross tonnage of the tanker is 2,215 GRT. The ship was built in 1967 and operated by Jaegers Reederei Gmbh.